Using the Shape Tool in Blend, you can draw a Rectangle, Ellipse or Line by left-clicking and dragging with the mouse. If you hold the Shift key down while dragging with the mouse, you will be constrained to drawing symmetrical shapes–squares (symmetrical rectangle) or circles (symmetrical ellipse). 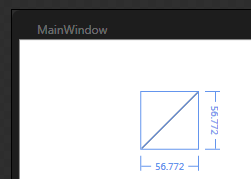 If you hold the Shift key down while drawing a Line, you’ll be limited to drawing lines at multiples of 15 degrees. This makes it easier to draw lines at common angles. If you hold down the ALT key while drawing any of these shapes, your starting mouse position will be used as the center point of the shape, rather than one corner.